We offer our clients customized contract terms, the best certified copier repair technicians, and competitive service guarantees. Not only do we have the best award-winning, manufacturer-certified copier and printer repair technicians and competitive service guarantees, our maintenance options also set us apart from other companies. Let us customize a plan for your office in DC, Virginia or Maryland, so you know exactly what to expect should something go wrong with your equipment. 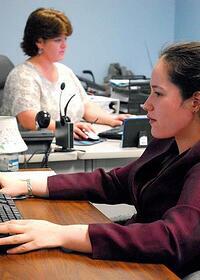 Your account will have a dedicated contract specialist. While each specialist is cross-trained, the difference here is that you will not be directed to a call center with transfers, hold times and other general frustration. You can call on this person for any contract related questions. Our specialists are customer-focused and willing to make adjustments to contracts, based on fluctuating volumes, peak periods and overall preferences to maximize your plan's value. You can select all-inclusive, semi-inclusive, parts and labor only, and even labor only plans. We offer tiered billing, which typically makes our clients more comfortable when budgeting. We believe that the looming threat of overages during a billing cycle should not impact whether or not you get your documents produced. With tiered billing, the higher number of impressions made will result in a lower cost per impression. We believe in the flexibility to choose your preferred billing cycle for your convenience and your industry. Traditional cycle options are monthly, quarterly, and semi-annually. Another thing that separates us from other companies is that we do allow a no-fee, no-penalty cancellation. We doubt you'll ever want cancel, but all we need is 30 days notice and we'll go away. You can bundle your plans together. Consolidate the number of invoices you receive and the number of vendors you rely on. We can provide maintenance plans for your printers and faxes, no problem. 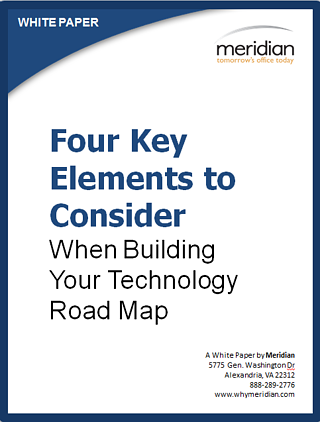 Gain insight into the true status of your IT system. 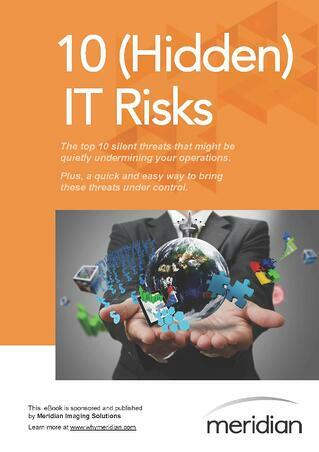 Downloading the eBook is the first step in managing and taking control of your IT environment. Learn about the four key factors in creating a unified workforce computing strategy. 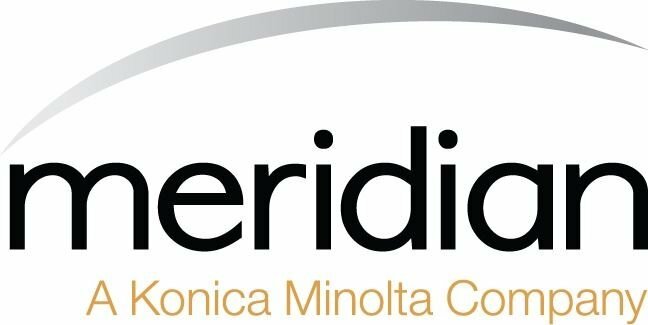 On Saturday, May 19, as part of a partnership between Meridian's Community Outreach Committee and Habitat for Humanity of Northern Virginia, Meridian VP of Sales Chris Lucci will participate in a high-adrenaline rappel down the 15-story Hilton Global Headquarters building to actively support Habitat NOVA’s mission. Help us send Chris OVER THE EDGE here! This is NOT your Typical Fundraiser! Habitat's 2018 Over the Edge event is one of the most highly anticipated and exciting fundraisers in Northern Virginia. This unique experience will only be matched by the participants' deep pride in supporting Habitat NOVA’s mission — building lives and homes for local families. With 80+ elite thrill-seekers – or “Edgers” – enrolled, the OVER THE EDGE event supports Habitat NOVA's program outreach including the 100 Families Served Campaign – a major milestone: 100 families served since the organization's inception in 1992. Habitat for Humanity of Northern Virginia (Habitat NOVA) is a vanguard affordable homeownership advocate, known for ensuring strong and stable local communities and families. The affiliate has a stellar 28+ year reputation of fostering strength, stability, and self-reliance for local families wanting to invest in themselves and their communities through affordable homeownership. Today, Meridian's Community Outreach Committee gathered together with other employee volunteers to contribute to the Cornerstones After School Snack Pack program — assembling 118 snack bags for donation, which the Meridian delivery team will drop off next week. The After School Snack Pack program entails preparing after-school snack bags for children served by Cornerstones programs. The Reston, VA based non-profit has been a Meridian Community Outreach partner for a number of years and primarily works in local apartment communities to connect residents to local services and often has children drop in after school for programs and help with their homework. Modern print technology has made it possible to produce large volumes of high-quality printed material right in the office. Depending on the size of your office, and your organization’s needs, print solutions are available in-house that in the past were only found at professional print facilities. In fact, print technology is so good now, particularly the multifunction printer (MFP), that many commercial print shops use the same machines found in many offices. So, aside from the availability of professional equipment, why are many businesses now considering bringing production printing capabilities in-house?